After spending many pregnant months researching strollers, we finally settled on the UPPAbaby VISTA ($699) for our son because of it’s sleek look, solid reviews including reviews stating that the company offers wonderful customer service, and the ability to add a jump seat if baby number two becomes a reality. It has been a great stroller for us, and as it can hold up to 50 pounds, it will work for us for years to come. 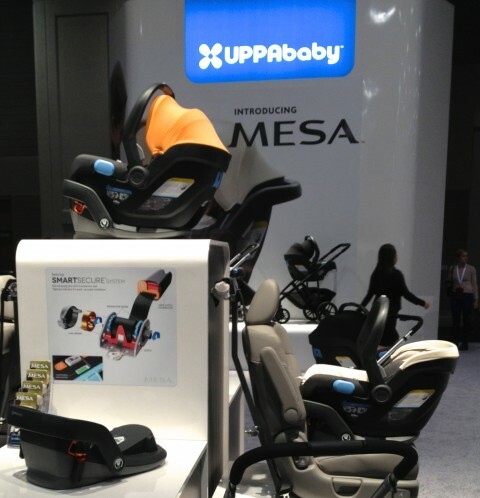 UPPAbaby recently debuted the MESA, their new infant car seat, at ABC Kids Expo 2012. It doesn’t require an adapter for the VISTA or CRUZ strollers, something you currently have to purchase regardless of which type of car seat you have. A hideaway SPF 50+canopy for sun protection. Finished bottom to protect car upholstery which eliminates the need for seat protectors. Seat protectors can be a problem for safe car seat installation. One-push stroller release on the carry handle for a smooth transfer. The UPPAbaby MESA (http://uppababy.com/products/product.php?id=272 )will be available beginning in March 2013. It will retail for $280 and come in four styles: DREW (tangerine), SEBBY (teal), LINDSEY (wheat), and JAKE (black). Looks so cool. Can’t wait to see it in person. Will it work with other stroller systems? Is it similar in size to other top brands? I love the colors. I’ve recently started a web site, the information you offer on this web site has helped me greatly. Thank you for all of your time & work. “Everyone is responsible and no one is to blame.” by Will Schutz.